Employee satisfaction is a key to an effective mobility program, so it is essential to know what are its most irritating features. One of our previous blogs (Should service providers be self-assessing their performance?) outlined how important it is to have a good handle on supplier performance and that a well-designed independently administered employee satisfaction survey will provide the data needed to address looming or existing problems. Ward O’Farrell Consultants has been conducting web-based employee satisfaction surveys for clients for many years and, in order to illustrate their value, we share with you the top concerns or annoyances recently expressed by relocating staff and their families. Our more recent surveys are telling us that the actual move of household goods is the main source of frustration for employees and their families. It appears that their ire is particularly aimed at the people packing and unpacking their belongings: disorganized boxes and labeling, carelessness with delicate or fragile items, etc. Their frustration is then exacerbated by a complicated claims process for lost or broken items that involves an enormous amount of paperwork. 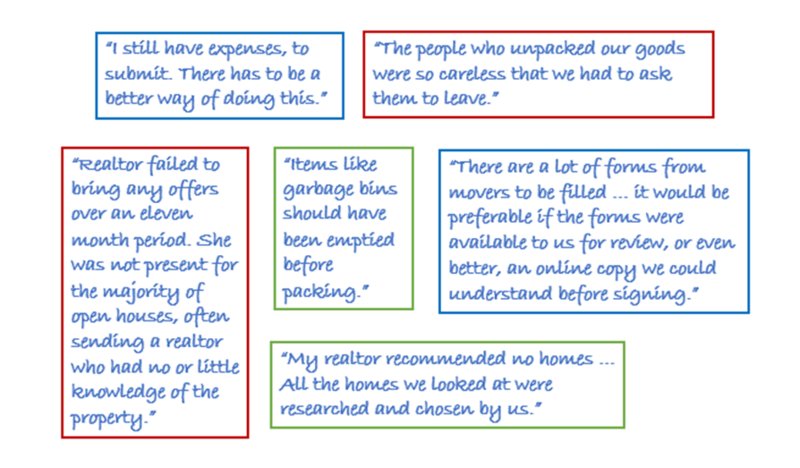 This type of feedback indicates that it’s time to meet with your moving supplier and set targets for improvements. These should include addressing employee training (e.g. tracking number of employees and timeframe), reviewing the service level agreement, or establishing of one if none is in place, and possibly the introducing penalties for non-compliance. In addition, insist on transferees being provided an emergency contact name and number for immediate support. Home search was second from the top. In many cases, we hear that relocating employees do not feel as important to real estate agents as are their other clients. The frustrations conveyed also apply to home sales. Complaints include lack of communication, effort, knowledge, and general concern for the employee’s situation. Recent comments indicated that the realtors were difficult to reach, presented a limited number of properties and that some employees ended up to doing much of the work themselves. It is important to use an experienced real estate professional, trained in corporate relocations. Without the right experience or training, even a good local realtor may not understand the circumstances and needs of relocating employees. The compressed time frame and urgency to start in the new position make clear and responsive communication key to the success of home searches. A third source of frustration for employees is the expense reimbursement process. It is often a cumbersome and/or a lengthy process. An inefficient process can lead to financial strain for some, and for others, be interpreted as a lack of respect given the sacrifices made to take on the assignment/relocation. Employees, especially younger new hires, may have maximized their credit cards and lines of credit while relocating. Even seasoned employees dealing with home sales, home purchases, renovations and travel can be overwhelmed by the number of expenses. In both these situations, holding up reimbursements for unusually long periods can be very disconcerting and stressful, as well as costly. There is excellent expense management technology available on the market to improve the process and provide easy tracking for employees. A common thread in all these surveys is that many employees and families need high touch communication from beginning to end. However, even with the best communication framework in place, “stuff happens”. Carefully crafted employee satisfaction surveys administered at the conclusion of the process provide valuable input into what’s working, what’s not or even what’s unnecessary. Suppliers will offer this service but can you be assured of that the results are completely objective? A survey administered by an independent third party such as Ward O’Farrell Consultants will provide an unfiltered evaluation of the relocation process and provide important data to support changes in order to improve efficiency and ROI.